In The Rings of Saturn (German, 1995; translated into English, 1997), one of the defining literary artefacts of the late 20th century, W. G. Sebald uses his own stroll through the East Anglian landscape as the gateway to a rumination on memory, history and deterioration. A purportedly autobiographical narrative digresses to discuss literary figures both local and distant, through Browne, Chateaubriand and Swinburne to the contemporary poet Michael Hamburger. 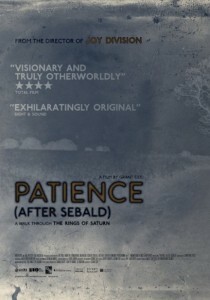 In Patience (After Sebald), director Grant Gee retraces Sebald’s footsteps. A formidable cast of academics, artists and writers – including Marina Warner, Iain Sinclair, Tacita Dean and Robert Macfarlane, to name but a few – provide commentary. Gee is probably best known for a series of acclaimed documentaries – Meeting People Is Easy (1998), the short (Tel Aviv) City Symphony (2000), Joy Division (2006) – that combine experimentation in film with popular music. Whereas his previous work could be characterized as dynamic, detached and self-aware, Patience is measured, elegant and sincere. The majority of Patience consists of greyscale still and tracking shots of the Suffolk countryside. Sebald, as we are told, repeatedly photocopied the pictures that punctuate Rings until they gained a grainy darkness; here the film is similarly dusky, turning Suffolk into some ethereal netherworld. Texts and images from the novel are often superimposed above, sometimes blended with, the landscape. A small window in the centre of the screen occasionally shows, in colour, Gee’s feet as he follows The Rings’ route. Gee uses recurring images – the carcasses of animals half-buried in sand or soil, deserted country lanes – to evoke the interconnectedness and sense of ‘looking back’ that permeates the novel. As a visual representation of Sebald’s perambulation, Patience is quietly successful, augmenting The Rings with its own cohesion. Particular credit must be given to Leyland Kirby’s soundtrack, which processes Schubert’s Winterreise until it becomes a smudged, haunted drone permeated with the detritus of the past. As arresting as Patience is, though, it fails to capture the imaginative riches of Sebald’s writing. Much of The Rings is devoted to the polychromatic debris of history, from the lives of Edward Fitzgerald and Roger Casement to the tyrannous Dowager Empress of late 19th century China. When releasing the book in English, Sebald wanted it published under “all the categories”, as both fiction and non-fiction, travel writing, memoir and essay. Patience seldom reflects the book’s multifarious and encyclopedic course, instead confining itself to the grey wastes of the walk. In doing so, it frustrates the book’s sense of multiplicity, and ignores its interest in the ordering and manipulation of knowledge itself. The film’s commentary focuses heavily on reading Sebald as a German writer concerned with his country’s post-war ‘conspiracy of silence’, simplifying the numerous layers of significance The Rings imparts on history and landscape. Paradoxically, Gee’s speakers aren’t arranged into any consistent order. Their mixed registers, from literary analysis and personal memoirs to impressionistic conjecture, fail to mould into a substantial disquisition. At their best they serve to illuminate parts of Sebald’s practice and character, while at their worst – perhaps Lise Patt’s discussion of creating cut-up poems from Sebald’s writing – they can seem trite and self-indulgent. Occasionally, as in the brief description of Browne as “really a poet”, they are erroneous. While Patience’s cinematography resembles, say, the still shots of Patrick Keiller’s beguiling Robinson films, it lacks their concentrated enquiry and considered tone. Nonetheless, Gee’s documentary is a heartfelt and engaging tribute to Sebald’s work, and a useful guide to The Rings’ background. Patience is at its best when Jonathan Pryce reads from the book itself, imbuing Gee’s photography with the author’s sonorous words. Here, freed from the disparate conjectures of others, language and image synchronise into something remarkable. Patience was released in the UK by Soda Pictures on Friday 27th January 2011 at the ICA cinema, London; Curzon Renoir, Curzon Wimbledon and around the country, as part of their important initiative, The New British Cinema Quarterly. Joe Lloyd is in his fourth year of studying English Literature at the University of Oxford. He tweets at @josephalloyd.